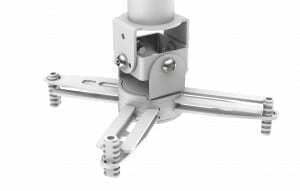 Smart The Techmount is a universal projector ceiling bracket designed to secure 99% of data projectors safety and sturdily to ceilings. It has built in flexibility allowing quick assembly in a number of different configurations, including “flush-mount” where the projector is as close to the ceiling as possible. In line with best-practise a safety fall-arrest tether is included which secures the projector to your bracket. Independent testing on calibrated test equipment measured a breaking-strain of half a ton! We recommend a maximum safe working load of 10kg which is well within the limits of the product and up to BSi installation standard specification (PAS122:2009). 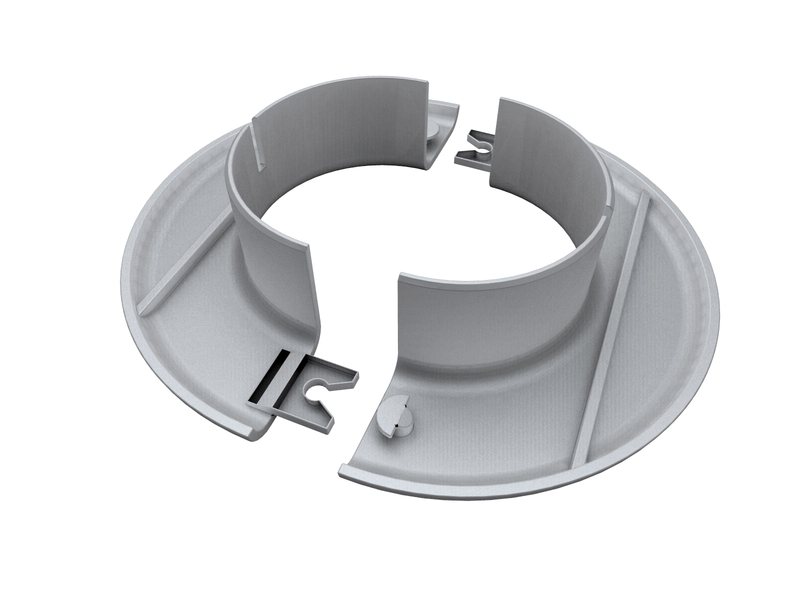 Rather than having a bolt that runs through the pipe and blocks cable access, we use our unique quad-bolt ‘chute-through’ system which leaves cable access clear – even for a big VGA connector. A spanner and pin-hex key are included. The only tool you’ll need is a 2″ pipe cutter (ask your tool supplier for a cutter with a 6-67mm (0.24″ – 2.64″) range, and a metal cutting disk). We’ve also included a drilling jig so you can easily and accurately drill 9mm (0.35″) holes into the pole. Quick-release mechanisms make life easier for thieves, so the TM-1200 is secure and features security bolts. Enhance aesthetics with the retrofittable trim disk which is fitted in false-ceiling environments to properly finish the installation.